The funding provided with this donation is close to 60% of the total $80,000 commitment that Renfrew Rotary has made. The total funding to date is an astonishing $53,400. Renfrew’s club is clearly instrumental in helping with the ongoing cost of our leading edge and progressive hospice. In addition to the hospice, Renfrew Rotary is active in raising funds for a number of initiatives that benefit not only our community, but the world: Rotary Homes, providing homes for the disadvantaged; the Rotary Hall at the Bonnechere Manor, providing a meeting space for resident of the Bonnechere Manor and local gatherings; scholarships for students to help them advance their education and; aid both monetarily and with manpower to build homes for the disadvantaged in El Salvador. The thirty two members of Renfrew Rotary are committed to making a difference in our community. Not only do they raise funds but they give their time, energy and talent in many ways: The Music Festival, the Interact Club, the Christmas Parade, New Comers night…to name a few. With its skilled members, Renfrew Rotary Club is world class. Having such an active club in a small town is a positive for everyone. Renfrew Rotary’s expanding reach is indicative of the unspoken motto “continuous self improvement”. And no doubt, its’ members would say that the fallout of this shared value is fellowship. A win for all! On December 6 the Renfrew Rotary Club pledged $6000 to the Robbie Dean Crisis Centre during the Heritage Radio Station Holly Jolly Radiothon. The Renfrew Rotary Club along with many of the Valley Rotary Clubs provided the seed money to get this Centre open at its first two locations in Renfrew and Pembroke that open June 2013. Since then one has opened in Arnprior and another in Petawawa. Additionally in support of this project the Renfrew Rotary Club holds an annual Trivia Night. The date for the 2015 Trivia night is February 14 to be held at Rotary Hall at Bonnechere Manor, Renfrew. For more details on this event contact Rotarian Janet Springer at 613-432-6694. Golf is known to affect those who play it with emotions ranging from frustration to elation. Golfers not only compete with others but more importantly compete with themselves, However, the tournament held by the Renfrew Rotary Club on July 25 at the Renfrew Golf Club evoked only fun! Turnout was strong, with eighty players vying in the Best Ball Tournament and another ten people partaking in the steak dinner provided at the day’s end. 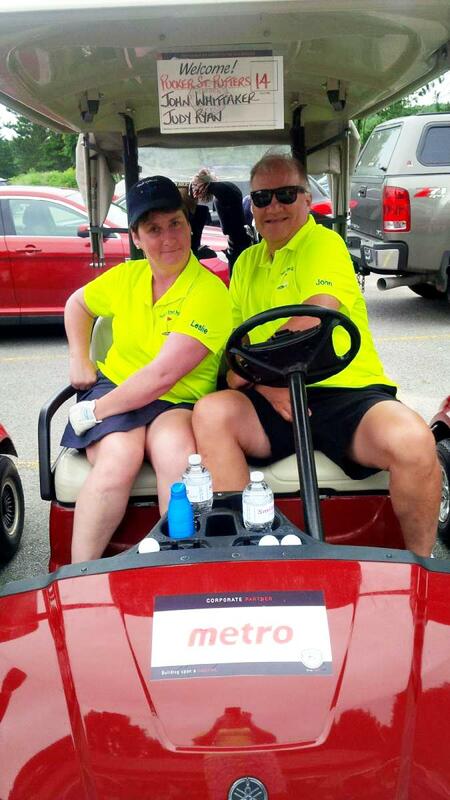 In addition to a delicious meal, the ticket for participating in the Renfrew Rotary Golf Tournament provided green fees, use of a golf cart, a light lunch and a treat bag. The value was clear and the fellowship was strong indeed. Creativity was demonstrated with the planning of the tournament with prizes for each of the sexes in the following categories: Men’s and ladies longest drive; closest to the hole; closest to the line; longest putt made; a prize for a mixed closest second shot; and a putting contest. Bragging rights were earned by the ladies with a perfect score in the ladies putting contest by Leslie Trouce of Burnlington, Ont., beating the men top put by sixty points. Way to go, girls! The 50/50 draw was won by Lucas Regier who graciously donated the proceeds back to Renfrew Rotary, enabling the club to expand on the good works it does for our community. Part of the $11,000 dollars generated by the golf tournament will go towards Renfrew Rotary’s $100,000.00 commitment to the Bonnechere Manor’s Rotary Hall. This lovely facility not only benefits the residents of the Bonnechere Manor but also Renfrew at large. No golf tournament is complete without the challenge of a hole in one. Although no one had such a stroke of luck in taking the purse of $10,000, everyone had aspirations of a sweet deal. Everyone left thinking “there is always next year”. A total of sixty prizes were given as well as auction items that were obtained by the highest bidder. With so much generosity on the part of sponsors and people of good will, everyone left with more than they came with. The event would not have been successful without the many sponsors that supported the tournament. Renfrew Rotary Club would like to thank not only its sponsors for their generous support but also the Renfrew Mercury for the coverage of their event. Although the goal of the Renfrew Rotary golf Tournament is to raise money for our community, it clearly is a win/win for those attending and our community. Thank you Renfrew!